It’s been raining on and off all week. Not wee little storms but huge loud thunderstorms. I hope my garden appreciates it! As you can see (unless you are reading via RSS then I highly suggest you visit the main site!) I’ve redesigned a bit. Would love your thoughts and if there is anything YOU want to see here! 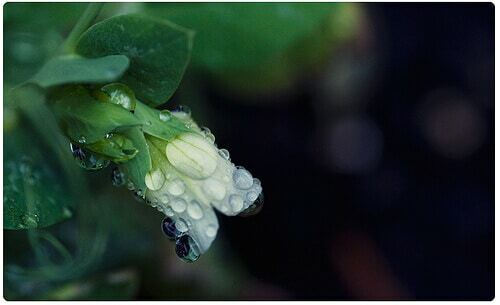 Here are some photos from the other morning of bits and pieces of the garden and yard after it rained. LOL thank you! I only think that if I win a Words w/Friends game which doesn’t happen often LOL! Just Stumbled this post. Love the photos. Yay thanks for the stumble! Beautiful photos! I’ve enjoyed the thunderstorms lately. Love the layout design! My only suggestion on that is that the name, email, etc. fields are kinda quirky in the sense that it only shows one letter…so you can’t really verify what you’re typing. I fixed the input issue! It’s like only firefox will display it properly where as in IE or Chrome the input box is HUGE. Ugh drives me crazy lol. I love your photos, these are beautiful!! I LOVE your new layout, super nice!!! 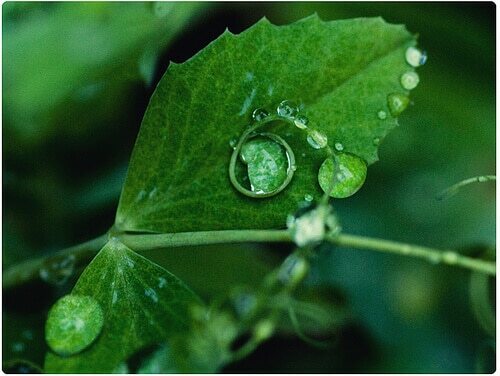 i adore water droplet photos- what lens are you using for these? are you using a tripod? i can’t seem to get mine quite as nice. Same here!! I used my Sigma 105mm macro lens and I did NOT use a tripod, these were all hand-held, early morning light, I did have the ISO cranked up a bit though. Ah! that makes sense. My telephoto lens has a macro setting but I haven’t had much success with it so far. Gotta keep practicing. Yep I have a Tamron 70-300 that has a macro setting but generally it’s not a true macro. I feel that my 50mm does a WAY better job at “macro” like shots if I don’t have my Sigma lens around. Those water droplets photos are insanely amazing! I could look at them all day. Yay thank you!! I should probably make prints eventually, maybe hang them in the kitchen lol. I’m sure the plants are soaking it up. Never know when there will be a surprise dry spell so they’re probably storing it too :D On the other hand, my crawling flowers are trying to strangle one another to grow upwards (winding around one another to have the strength to move upward). Really need to get them in the ground. Hopefully this weekend. It looks like one of the basil plants just couldn’t handle the storms and all the water, it looks dead ugh. I still have 3 others planted PLUS a jar of basil seedlings right now but still!! OH awesome! Our yard is mostly clover and confederate violets. 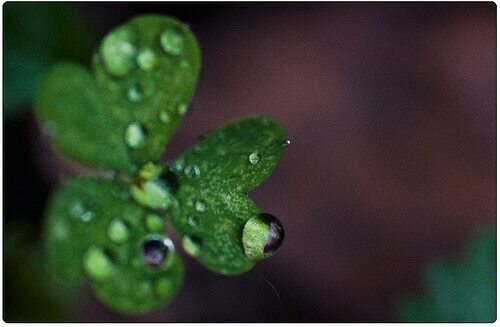 I would LOVE to find a 4-leaf clover one of these days! Gorgeous. 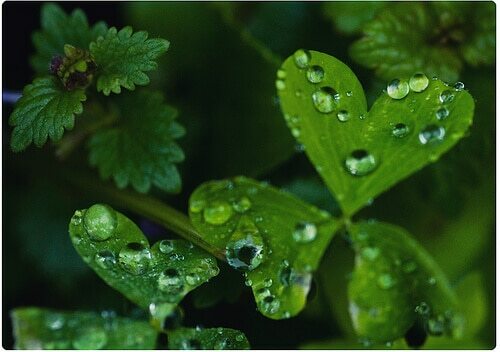 I love the way you captured the water droplets on the clovers. Fantastic. Love your new layout too. Yay thank you! It was REALLY cold that morning too so I was pleased to see my plants survived the night lol. Of course I love the layout, AND the new comment “correspondence,” is beautiful! I just read “The Sweetness at the Bottom of the Pie,” and your new layout is so reminiscent of some of the themes in that book that it was a little spooky to see it! I love your beautiful little strawberries! They’re coming along well, aren’t they? 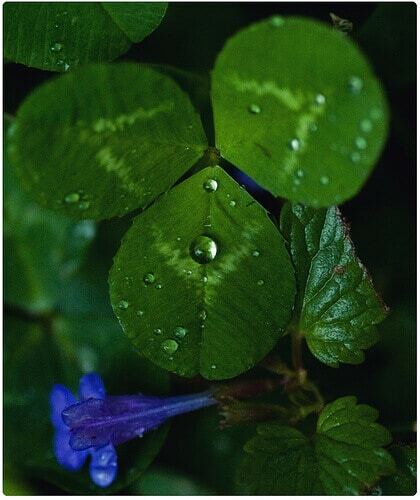 The clover in the topmost photo looks like a perfect heart! You eye never ceases to amaze me! You’ve got mad skillz, Sarah! Oh what is that book about? I wonder how long it will take for the berries to ripen? It seems like they’ve been white forever! Aww thank you SO SO SOOO much! 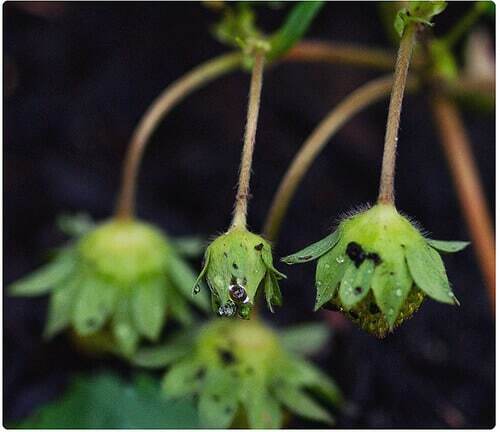 Well, your garden seems to be a week ahead of mine, and my strawberries are usually ready late-June, so I’d say first week of June or second for yours. The book is a mystery, featuring 11 year old sleuth Flavia De Luce. She lives in a manor home in England in 1950, and she has her very own chemistry lab which she uses to a)concoct poison ivy lip sticks to torture her big sister, and b) to solve murders. It is NOT a childrens book, though. The sequel is called “The Weed that Strings the Hangman’s Bag.” I highly recommend reading them :). I am so excited about the strawberries it’s ridiculous lol. I will have to see if our local library has those books available! I desperately need new reading material! Great photos. I really like the first one with its heart-shaped leaves! You have a garden and a new theme? Wow. I’ve sure missed a lot lol. The theme is beautiful as always. I specially like the comment text area. Looks rather nifty. Thank you SO much! What direction does your balcony face? How much sun does it get (hours)? You can do an AWESOME garden in pots/window boxes. Fruit like berries, tomatoes, herbs, anything really!! Oh it totally gets a lot of sun. Really? Tomatoes? Berries too? I didn’t think a box would hold anything more than some simple herbs. That’s good to know. Looks like I’ll be making a trip to the library. Time to see if this veg head has a green thumb too. Oh yes! Here is a great site, You Grow Girl. Has forums and such. She also came out with two books so I suggest checking out the local library or bookstore for those! You can grow anything in a container! Thank you so much! I used a high ISO so that I could use a faster shutter speed so they wouldn’t be too blurry. BEAUTIFUL Pics (and I’m a photog!) Love the layout too, did you design it yourself? PS. Found you via SITS, and I have the same issue of some “little shadows” that visit me all over the net too. Thank you Lana! Yep I did the whole theme myself including coding! I’ve never used a pre-made theme or design on OSN ever! Oh yes, it’s frustrating isn’t it? You don’t want to acknowledge them and give them more “power” yet it’s SO bothersome at times that you can’t help it! Wonderful! Do you do this for other people too? I’m not in love with my “theme” atm (I have none) and can’t find a theme out there that I like. Yep! I created a Price List!